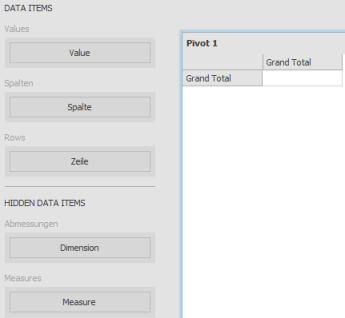 Values the section contains data items used to calculate values displayed in the pivot table. Columns the section contains data items whose values are used to label columns. Rows the section contains data items whose values are used to label rows. If the Columns section or Rows section contains several data items, the pivot table column and row headers are arranged in a hierarchy, and make up column and row groups. Use the Initial State button in the Data tab to open or close the groups. This button invokes the popup menu that allows you to select whether column and row groups should be collapsed or expanded by default in a Dashboard Viewer. Pivot - InLoox • Copyright 1999-2019 © InLoox, Inc. All rights reserved.